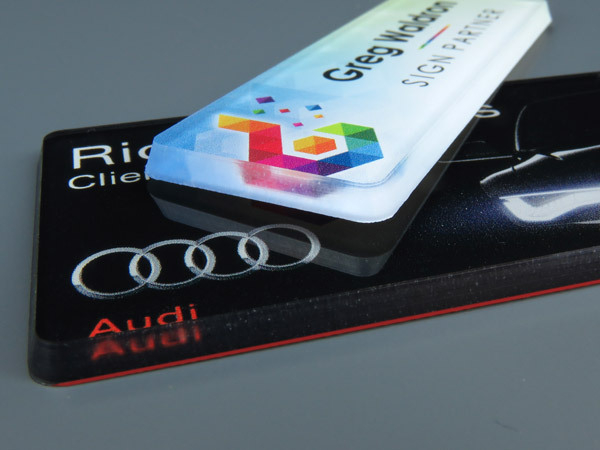 Showcase your logo beneath an eye-catching clear dome. 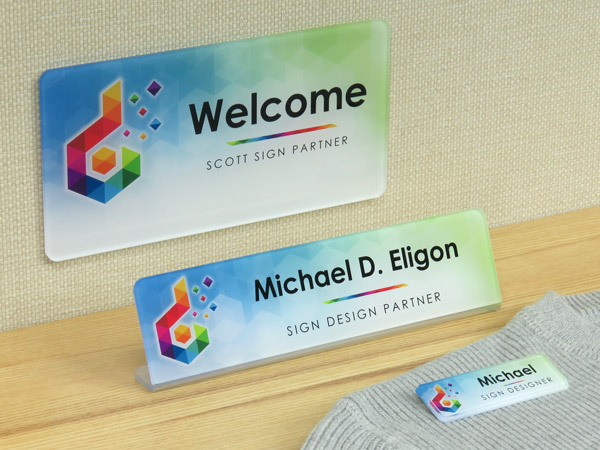 Don't just greet new friends or customers...dazzle them with Scott ColorDome® name tags that blend color and congeniality into the perfect introduction. Our powerful website puts you in control, allowing you to review thousands of vibrant selections or design a custom domed name badge that lets your people and your company shine. In fact, turn our site into your own private workshop, then order as many as you like. Again and again. Or send us your logo and we'll create a secure, custom web page where you can order - and re-order - in just a few clicks. 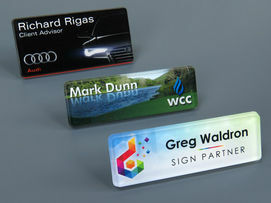 Consider this approach to manufacturing an eye-catching domed name tag - where less is actually more. Less distraction from busy borders leads to more image space, and ultimately more impact for that initial introduction. We print your design beneath a water-clear acrylic panel, then machine a flawless, round-corner beveled edge to create a soft visual frame. Great names are made, not born. For yours, start with these popular rectangular, domed name badge sizes. Our most popular 1" x 3" presents your logo with room for a name and title too. To distinguish your staff from your guests, the 1 1/2" x 3" tag adds just enough size to gain attention without detracting from professional attire. For these name tags, the message is innovation! We machine a flawless, beveled edge along the sides and around the corners, enhancing but never intruding on the design. 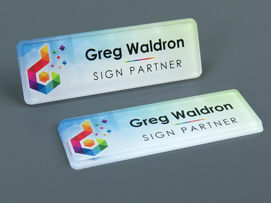 Add a fabric-friendly magnet to hold your domed name tag flat against the fabric - it's the perfect look. Examine us in the light - we make it right! 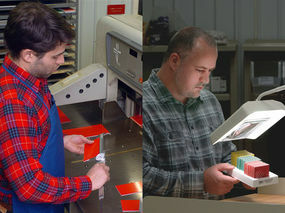 Scott Machine is your complete sign partner, featuring our modern machine shop, color-matching capabilities and a solid business reputation that extends 55 years! Need to reach us? Call us, and we'll answer in person - by the 4th ring. We think you deserve that kind of respect. Our secure e-Badge Design client pages enable you to design and re-order simply, reliably and consistently. In fact, any staff member of yours who has your password can order badges in just a few easy clicks. So don’t just consider the cost of the name tag itself; factor in the cost of ordering and re-ordering, and you’ll see that Scott Machine gives you more selection, more control – all at less cost.